In the last blog we explored the longer-term climate changes and sea level changes that occurred throughout the early evolution of modern humans up to the last glacial maximum 26,000 years before present: http://awhio.com/blog/2017/10/19/blog-15-water-ice-and-rising-sea-levels-global-flooding-before-the-younger-dryas. It is evident that throughout the last several 100,000s years of human development there have been numerous incidents of changing sea levels that would have been imprinted on the human psychic and recorded in myths such as the Global Flood story. There is rightly a lot of interest in the history of Homo sapiens in the critical developmental period since the end of the last “Ice Age”. In particular Hancock in his most recent book proposes that during this time a highly evolved civilization developed and was eradicated. He suggests that the remnants of this civilization jump-started present-day modern society following the Younger Dryas (YD) period about 10,000 years before present (YBP). His proposal is that the world was warming up from the last glacial maximum (LGM) and becoming increasingly habitable when a comet impacted the North America ice sheet causing it to catastrophically collapse, resulting in a large amount of freshwater flooding low-lying coastal lands, entering the oceans, raising sea levels and eliminated the core of an advanced civilization. While Hancock proposes that the most significant climate event in the past 20,000 years was a comet strike 12,900 YBP, it needs to be recognized from the climate temperature record and oceanographic data that the period between the LGM and the YD was a time of great change, all of which would have been experienced by humans living through them. But the pattern of these changes and their impact on human memory, myth and culture is still a big question. The question is about what humans would have experienced in this period of time. How could the climatic changes be connected to a global flood myth? Humans were responding to the great changes in their world. We explore that in this blog. By the end of the LGM, humans had experienced a wide range in climate throughout their development and evolution. Figure 1 shows temperature changes over the last 400,000 years corresponding roughly to the period of modern human development. Note that throughout this period there were large fluctuations in temperature from a few degrees warmer than present down to more than 10 degrees C colder than present day conditions. One can pick out the low temperatures of the LGM, around 26,000 YBP, on the right hand side of the graph. Figure 1. Climatological temperature record temperature for the last 400,000 YBP. The cold temperatures associated with the last glacial maximum (LGM) can be seen on the right-hand side of the graph (http://www.grida.no/resources/6878). At that time the shoreline was 100 m/300 feet lower than present-day levels (Figure 2). This would be the second time in the history of modern humans that extensive areas of the World’s coastline were exposed such as the Sundaland and Sahulland in Southeast Asia. The first time humans journeyed to Australia. This second time of lower sea levels humans sailed down the west coast of North America. As a result humans were now living throughout Eurasia, Australia and North America. Also of note is that as the climate began to change out of the ice age, the last refuge of Neanderthals on the coastal plains off of Gibraltar flooded and the species went extinct after over 400,000 years of existence. Figure 2. Stylized smoothed representation of global sea level in the past 20,000 years before present with melt water pulses highlighted (https://en.wikipedia.org/wiki/Meltwater_pulse_1A). The LGM was an extended period of cold temperatures. It resulted in the extensive buildup of ice and snow on top of the northern continents. It is often reported that the ice was 2 miles think over North America. But what does this mean? What would a 2-mile thick Laurentide ice sheet “look like”? Figure 3 shows what the landscape looks like from 2-miles above. This is the maximum height from the middle of the ice sheet in middle and northern Canada. That is a lot of water frozen into ice and snow. But there is a lot of variation in the thickness of ice. Of importance is that, although much of the north continent was covered in ice, it was much thinner, and lower in elevation at the edges of the ice sheet. For instance, most of the peaks of the Rocky Mountains at less than 2-mile elevation remained unglaciated and as a result still retain their jagged angular structure in contrast to the smoothed U-shaped glacial valleys. Importantly for our discussion, as always water flows downhill – even for continent-wide ice sheet. Melting glacial ice would flow from the high centre to the edges and ultimately into the oceans. igure 3. A photo of the landscape taken from 2-miles up in the air. Roads are distinguishable but houses are difficult to pick out. After about 10,000 years of stable cold temperatures a global warming trend began. Without a doubt, following the LGM, temperatures were increasing, the ice sheets were melting and the sea level was rising (Figure 2). But in regards to the global flood myths, it is critical to ask whether the sea level rise was slow and gradual or sudden and devastating? The speed of the sea level rise is critical in any consideration of any event possibly considered a flood. Slow even melting of the ice sheet with gradual sea level rise is unlikely to have left a doom and gloom impression on the humans living at the time. For instance the present day sea level rise is estimated to be on the order of 2 to 3 mm/year resulting in maybe 0.5 m rise by 2100. This is likely on the same scale as that seen in the data presented in for 20,000 YBP (Figure 4). While slow and steady sea level rise would have been a challenge for humans at the time, it would have been slow enough to allow humans to migrate upland to avoid flooding. But what if such a sea level rise occurred over a much shorter time period, possibly in a single freshwater pulse. Is there any evidence for punctuated sea level rise? Figure 4. Sea level rise estimates over the past 24,000 years showing periods of rapid rise and slower present day rates. https://en.wikipedia.org/wiki/Sea_level_rise. Shortly after the end of the LGM as the global climate began to warm, oceanographers has identified two significant events associated with a potential flood event. The first is a large influx of melted freshwater entering the ocean. The event is called a Meltwater Pulse. This is shown as Meltwater Pulse 1Ao (MWP-1Ao) in Figure 2. While the general trends in sea level are evident in Figure 2, the exact timing and duration is difficult to confirm from the existing data. Figure 4 presents that underlying data with its variability. The second event of the period that oceanographers have identified is called a Heinrich Event from around 18,000 YBP. These are events where heavy rock debris from the land gets transported and deposited thousands of kilometres away from the shoreline. They have been observed in the sediment record particularly in the middle of the North Atlantic Ocean. While the mechanisms are still not clear, the are associated with instability in the great ice sheets. The oceanographic data supports the occurrence of something dramatic occurring on a global climatological scale that would have resulted in sudden, unexpected and catastrophic events for human populations living in the World’s coastal zones at the time just following the LGM. The oceanographic evidence for meltwater pulses and the transportation of continental sediment to the middle of the ocean much better supports a flood myth. They could not have occurred with gradual sea level rise. While the exact timing and duration of the temperature rise, Meltwater Pulse, and the Heinrich Event is difficult match, it is notable that they both occur before temperatures showed much increase. The next question concerns possible mechanisms for a catastrophic collapse of the ice sheet. Hancock proposes a comet impact much later for initiating a catastrophic collapse. But MWP1Ao and the Heinrich event occurred thousands of years before the time of Hancock’s interest. Is there another mechanism to translate the slowly melting ice sheet into a torrent of freshwater into the coastal zone? A recently published paper proposes a mechanism where supraglacial mega-waves of meltwater could develop and propagate across the tops of the ice sheets to produce gigantic, fast-moving waves of water. The paper models the aggregation of pools of water as meltwater would flow down the ice sheet towards the continental edge. With sufficient amount of water flowing down a typical ice sheet slope, a mega-wave would develop travelling at incredible speed. As reported in the paper, the model results suggest a 100-m/300-ft high wall of water travelling at 900 km/hour – 500 miles/hour hitting the coast. It is likely that the freshwater would travel down to the coast along huge rivers of meltwater running on top of the ice sheet. Gradual warming temperatures is all that would be required to generate such a mega-wave on the top of the world’s ice sheets. This would definitely be experienced by living humans as catastrophic, potentially eliminating coastal cultures with possibly only a few individuals surviving. Truly it would have been experienced by coastal human societies as a flood event. Such a simple mechanism could explain the evidence for the meltwater pulse, the Heinrich event and sea level rise. Temperature and sea levels continued to increase for thousands of years before the next period of dramatic change 15,000 YBP. Around this time the oceanographic data shows evidence for another Meltwater Pulse - Meltwater Pulse 1A (MWP-1A) (Figure 2). 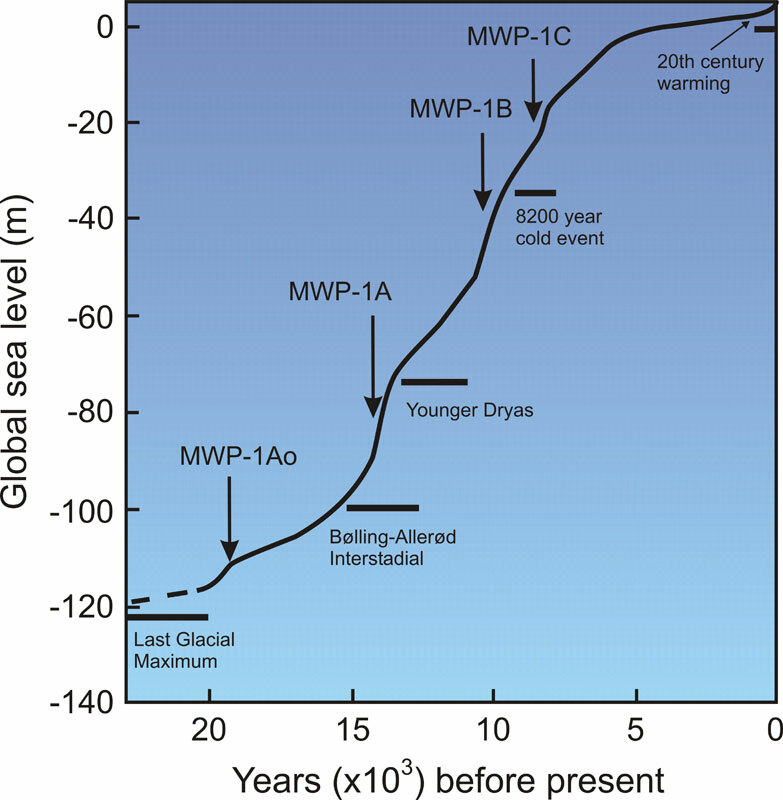 The period of MWP-1A that indicates a dramatic 30-meter/100-ft rise (Figure 4). For comparison modern day estimates for sea level rise is calling for around 1-m/3-ft of rise by 2100. But again, the oceanographic data supports punctuated sea level rise, possibly as a result of a number of instantaneous flooding events. In Figure 4 MWP-1A appears to have occurred over a very short time period that is difficult to accurately resolve from the data. The shorter the duration, the greater the impact on humans and the more consistent it would be with the concept of a global “flood”. One researcher refers to the MWP-1A as Catastrophic Rise Event number 1 (CRE1) in the Caribbean Sea! In regards to what humans experienced, other authors have argued that this time period is significant in our cultural memory and beliefs. Collins suggests that the time period is recorded in the bird carvings found at Gobekli Tepe - the first megalithic construction of humans from 10,000 YBP. He has further written about the importance of the constellation Cygnus in the Milky Way to humans. Humans would have observed Cygnus as the North Pole at this time period. Due to the wobbling rotation of the Earth called precession the location of the North Pole moves slowly in a circle in the sky. Around 14,000 to 16,000 YBP the sky would have revolved around Cygnus and its spot in the Milky Way. Cygnus may be represented in the earliest megalithic constructions of Göbekli Tepe. It may also be central to the work of the Ancient Egyptians. Following the events around 14,000 YBP, the global climate continued to warm, sea levels continued to rise and humans would have enjoyed the benefits of improving living conditions. This all changed around 12,900 YBP when the temperature suddenly stopped rising and dropped dramatically by 4 degrees C in a very short time period at the onset of the Younger Dryas (YD) (Figure 5). Returning to Hancock’s proposal that there was an civilization eliminated at the beginning of the YD, there are a couple of points of note. Without a doubt humans like to live in the coastal areas of the world. The secondly there were greater changes in temperature and sea level in the millennium that preceded the YD than during the YD (Figure 5). Secondly, there is strong evidence from the oceanographic data that there were a number of flood events since the LGM that would have equalled or surpassed anything that would have occurred at the beginning of the YD. The third and final point is that if there were an advanced civilization living in the low coastal areas of the world after the LGM, any evidence of their activities would be submerged below 100 m/300 ft of seawater. Figure 5. Climatological temperature record temperature for the last 400,000 YBP. The cold temperatures associated with the last glacial maximum (LGM) can be seen on the right-hand side of the graph (http://www.grida.no/resources/6878). The bottom line is that there is evidence for several sudden and catastrophic flooding events since the LGM. Coastal zones of the world would have been greatly impacted. A mechanism has been proposed for ice sheet melting that does not require a comet impact – although an impact certainly would result in similar impacts. Humans living since the LGM certainly would have been culturally developed to experience and remember such catastrophic events. Hancock. G. 2015. Magicians of the Gods The Forgotten Wisdom of Earth's Lost Civilisation. Hodder & Stoughton.